A MVC (Multi-view video coding) method, which uses both an illumination change-adaptive ME (Motion estimation)/MC (Motion compensation) and a 2-D (Dimensional) direct mode, is proposed. A new SAD (sum of absolute difference) measure for ME/MC is proposed to compensate Luma pixel value changes for spatio-temporal motion vector prediction. Illumination change-adaptive (ICA) ME/MC uses the new SAD to improve both MV (motion vector) accuracy and bit saving. 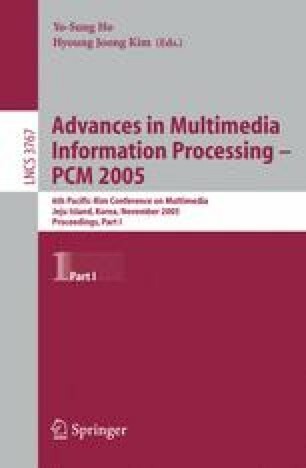 The proposed 2-D direct mode that can be used in inter-view prediction is an extended version of the temporal direct mode in MPEG-4 AVC. The proposed MVC method obtains approximately 0.8dB PSNR increment compared with the MPEG-4 AVC simulcast coding.